Manufacturers offset price reductions by offering owners less ballast water treatment system, we are confdent that when it aftercare and fewer additional services, and there’s a risk that comes down to the wire, De Nora has the experience, totalling increased commoditization will encourage a ‘ft and forget’ 95 years of knowledge and testing in electrolytic disinfection, mentality amongst suppliers. to wear the mantle of experts in our feld. In the retroft case, if owners are investing in ballast water treat- Whatever a ship operator might decide, they should fnd an ment, it’s clear they’re expecting a further ten or more years of OEM willing to take the time to offer practical, unbiased in- operation for those ships. 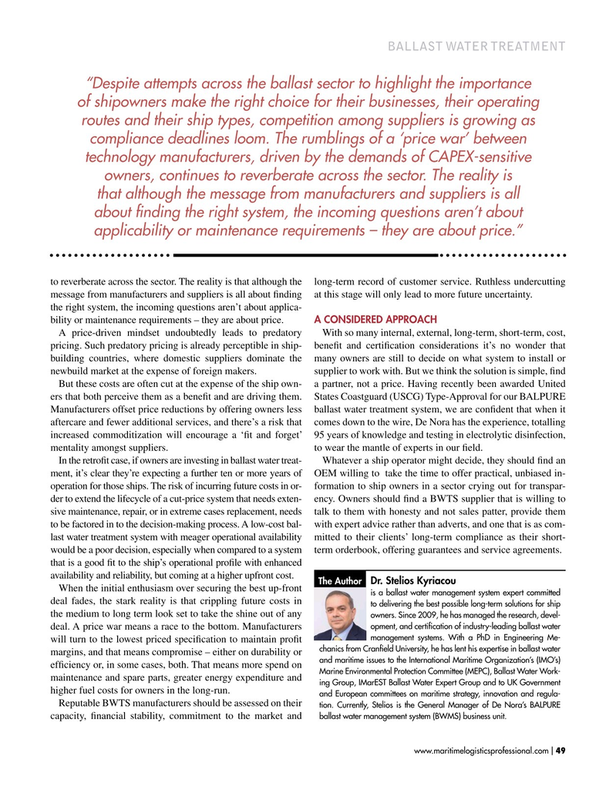 The risk of incurring future costs in or- formation to ship owners in a sector crying out for transpar- der to extend the lifecycle of a cut-price system that needs exten- ency. Owners should fnd a BWTS supplier that is willing to sive maintenance, repair, or in extreme cases replacement, needs talk to them with honesty and not sales patter, provide them to be factored in to the decision-making process. A low-cost bal- with expert advice rather than adverts, and one that is as com- last water treatment system with meager operational availability mitted to their clients’ long-term compliance as their short- would be a poor decision, especially when compared to a system term orderbook, offering guarantees and service agreements. that is a good ft to the ship’s operational profle with enhanced availability and reliability, but coming at a higher upfront cost.